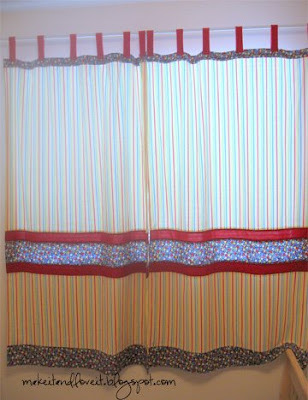 Home » Crafts, Sewing, & Home Decor » Home Decor » More CURTAINS, etc. Still need some more color? 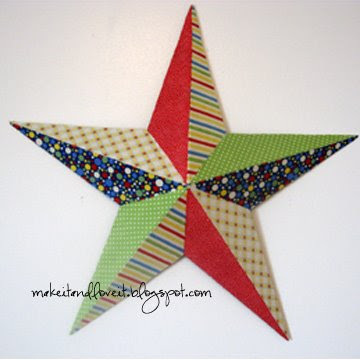 Try using THIS tutorial to make a colorful star for the nursery. To make these, just connect squares/rectangles of fabric, with some narrow strips of fabric between them. Finish it off the same way as the curtain tutorial HERE and attach long pieces of ribbon to tie around the bars of your crib. Want to throw their name up on the wall? Sew some fabric squares together and applique the letters of their name to the squares. Attach some twine to the back of each block and hang them up above their bed. Ooops, I haven’t finished my little boy’s yet and he’s 6 months old now. Sorry buddy. I love you just the same. So cute! you have totally inspired me for my little girls nursery! i dont have the crib up yet, but how long is the crib curtain? From crib to floor? and did you line the crib curtain as well? So, stinkin’ cute I love it all!